Former Fleet Fox, Father John Misty, to play Liverpool’s Mountford Hall in July, Getintothis’ Paul Higham with the scoop. It is no exaggeration to suggest that something of a cloud hung over Liverpool’s live music scene at the start of the year. The closure of the Kazimier, the music community’s focal point and beating heart, left many wondering if the city’s pulling power would be reduced. Would the loss of such an iconic space mean fewer artists heading westwards along the M62? We needn’t have worried as 2016 is turning into a vintage year. Hot on the heels of the recent announcement of Low at the Epstein Theatre, the good folk at Harvest Sun Promotions have pulled another rabbit out of the hat. Father John Misty will play a special date at Liverpool’s Mountford Hall on Saturday July 16. Having shot to prominence for his role behind the drums in Seattle’s country-folk phenomenons Fleet Foxes, Father John Misty released some fairly charmingly low key releases under his own name, J. Tillman before finding his voice under under his pseudonymous identity. 2012’s Fear Fun was followed up with one of 2015’s standout releases. Produced by Bella Union stablemate Jonathan Wilson, I Love You, Honeybear is a remarkable work. In a similar vein to John Grant‘s Queen of Denmark, the album embraces the many facets of the great American songbook. Borrowing from the worlds of folk, pop and country his work subtly subverts. Lush orchestration is juxtaposed against dark and personal lyrics that reinvent the notion of the love song without being either overbearing or saccharine. It is an album that reveals itself with repeated listens; at times bittersweet, often sad, cathartic yet uplifting its lyrical prowess seems to creep up on you unnoticed. The skill at the heart of Honeybear is to bring together a range of styles that work as one in songs that offer an unsentimental personal account of his marriage. Its, at times, easy listening vibe provides an aural hug that makes this blackly humorous album perfect for almost any occasion. It is a record that almost adapts itself to your moods; one to laugh, smile and cry at, often in the same sitting. 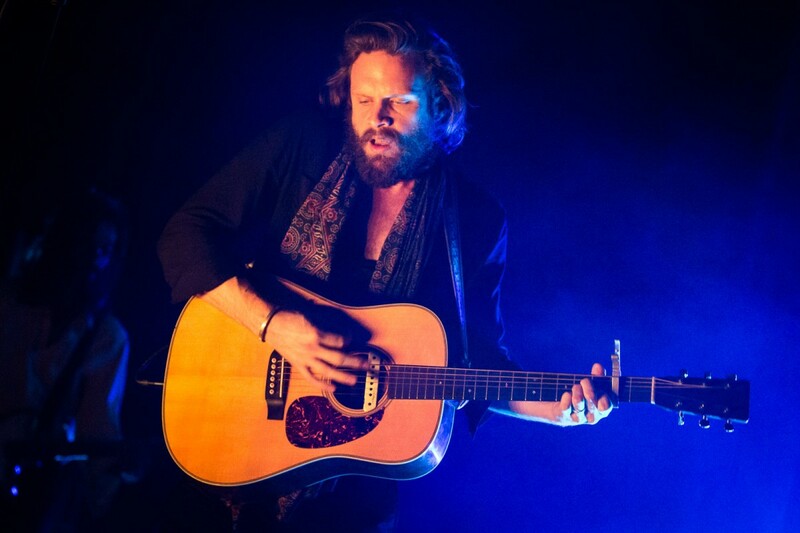 Come July 16 we’ll be in an excitedly expectant mood as the visit of Father John Misty proves that there is plenty of life left in Liverpool’s live music scene. Father John Misty plays Mountford Hall, Liverpool on Saturday July 16. Tickets available here.